Never entered a "Rafflecopter" giveaway and want to know more? Click here for a 52-second video on how to enter a giveaway via Rafflecopter. I love this holiday for many reasons, but mostly for gathering friends and family together to enjoy the spirit-lifting nourishment of each other's company. It doesn't happen often enough that we manage to slow down and just "be"…to savor all the moments as they unfold throughout each day. I often think ahead too much and i know that sometimes i miss things that are right in front of me because of it. But i continue to practice coming back to "now" — to the most important moment there is because we are living it. The "now" is abundant with reasons to give thanks, and each day i realize how much i have to be grateful for. I hope you do, too. 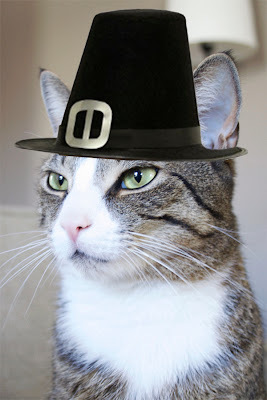 My thanks to you for staying connected and sharing your creative spirits with me. Your beautiful handmade creations and kind words have brought so much happiness to my life and if i could hug each one of you, i would! As a token of my gratitude, i thought it'd be fun to do a "12 Days of Giveaways" tribute to you ... starting this Friday, November 29 through December 10th. We'll be giving away all of these colorful goodies, one day at a time! Eleven of the prizes will be themed collections of products featuring my designs — aprons, dishtowels, journals, notecards, party sets and more. And one prize will be a gift certificate to our shop — with free shipping to wherever you live. We'll post one giveaway every day and announce winners the following day. You can enter every day and there are lots of ways to enter multiple times, thanks to Rafflecopter. Should be fun and i hope you'll join us! All our best to you and your loved ones. 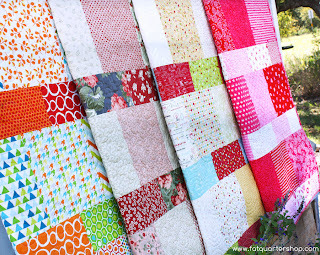 Today i'm sharing a really fast, fun and free quilt pattern from my favorite Kimberly at Fat Quarter Shop. It's called Layer Cake Lemonade, and i'm not even kidding you can make this cute quilt top in about an hour. 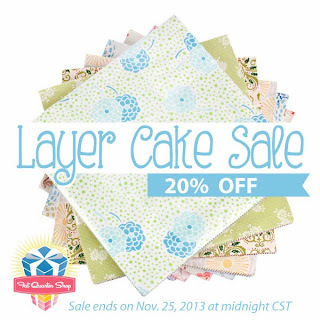 It uses one Moda Layer Cake with a little leftover that you could use as part of the backing. Here's an instructional video from Kimberly and the crew! 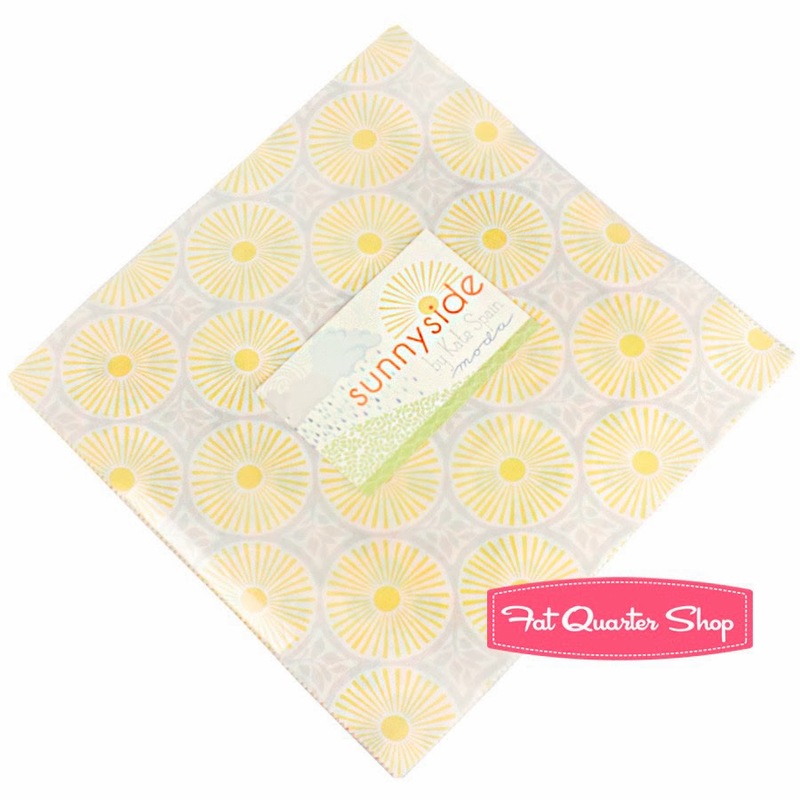 I decided to make mine using a layer cake of Sunnyside. 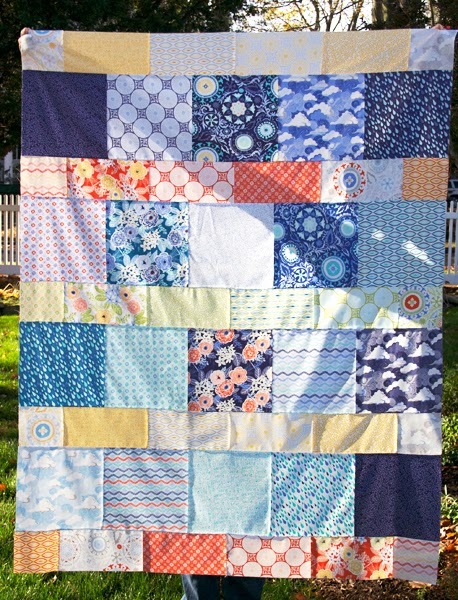 I definitely plan on finishing this up and making a few more for Christmas gifts! 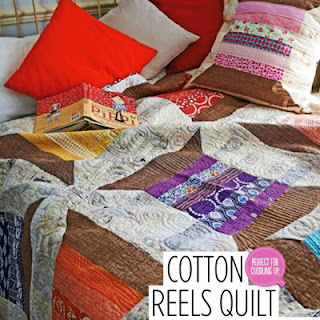 If you'd like to make one too (beware, they're addictive), you can download the free pattern. And then guess what? Kimberly is generously offering a sale on all Layer Cakes this week! 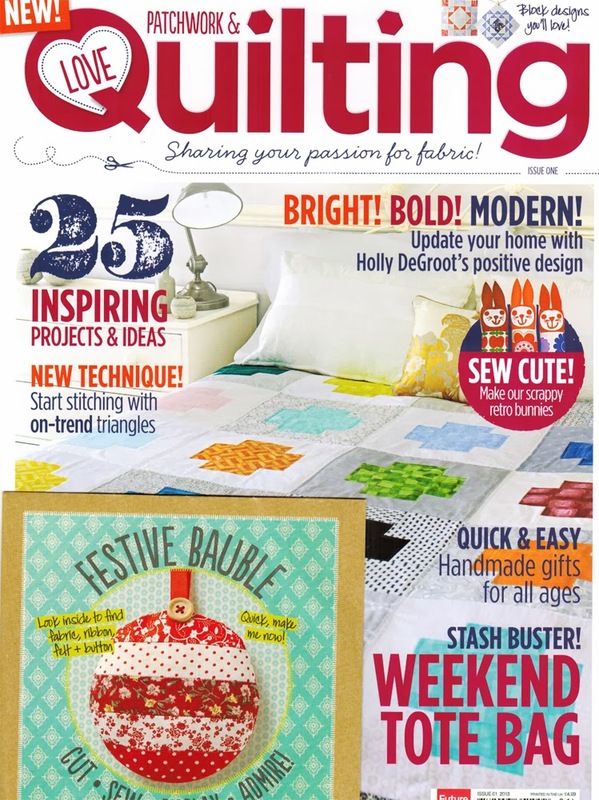 I finally got my hands on Issue One of the UK-published Love Patchwork and Quilting magazine. Have you heard the buzz about it already? Well, it's all true! I couldn't stop myself from flipping through the entire issue from cover-to-cover the moment it arrived. The fun started right away with a simple, cute and free "Festive Bauble" kit that's attached right there on the cover. How smart is that? It's complete with fabric, felt, ribbon and even a button! The talented Lynne Goldsworthy's striking and beautiful Block of the Month quilt design. 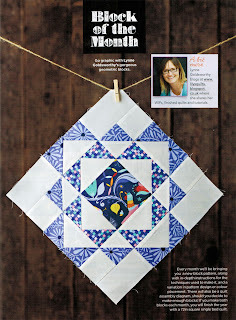 I was totally surprised and tickled to see that she used Daydream, my upcoming fabric line for Moda, in her design. Thank you, Lynne! 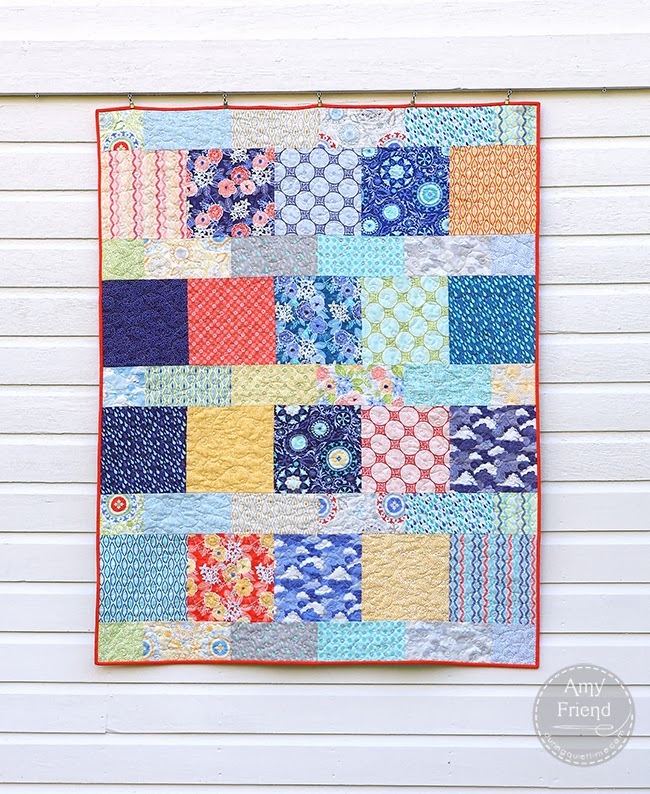 There's also a bright and bold stash-busting quilt called Cotton Reels designed by my favorite monkey, Katy Jones, of I'm a Ginger Monkey. 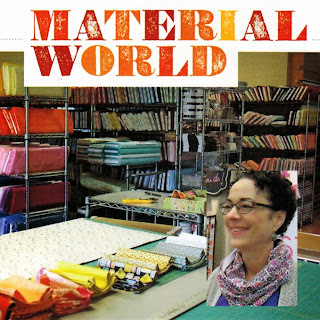 And, i was delighted to read a terrific interview with the industrious and savvy Kathy Mack of Pink Chalk Fabrics ... whose advice for a new quilter is, "Be fearless and enjoy the journey!" What a wonderful message from a wonderful person. 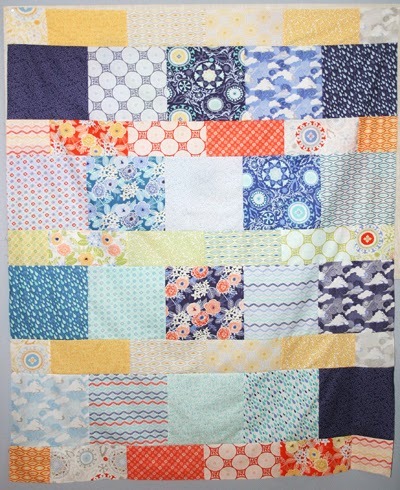 There's lots more from Tula, Jenean, Jeni, Maureen and many others. So be sure to check out LPQ on Pinterest, Facebook or you can download the app from iTunes. Can't wait for Issue 2. National Star-Spangled Banner Flag G.H. 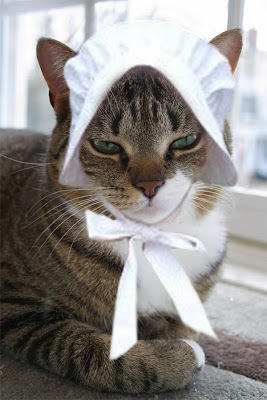 Preble, 1874. Look really closely at how small the people are to absorb the enormity of this flag. It's 36 x 29 feet! 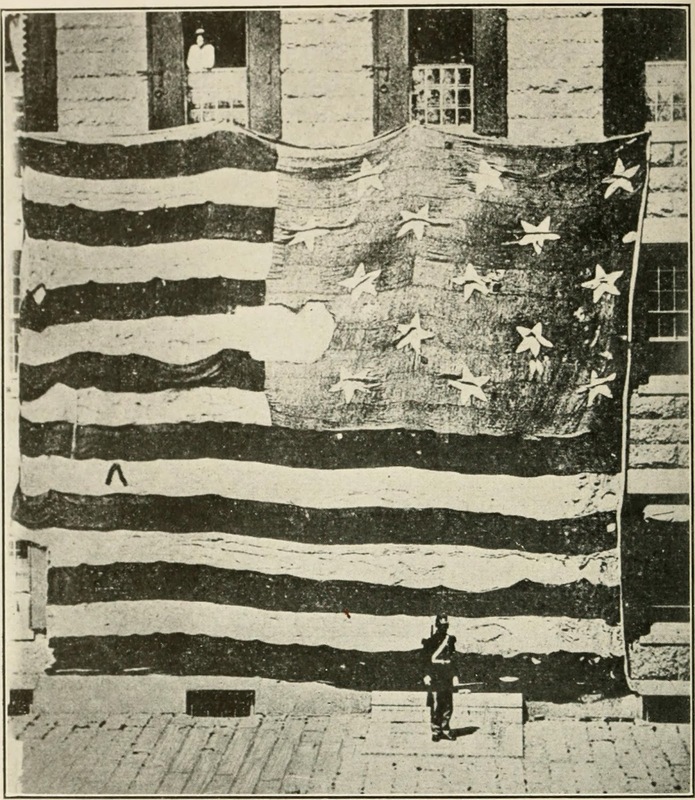 It's the same flag that flew over Fort McHenry in 1814 during its bombardment by the British, which was witnessed by Francis Scott Key who soon after composed the "Star-Spangled Banner". 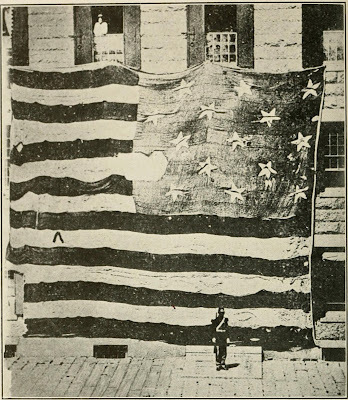 The largest U.S. battle flag at the time, this enduring piece of U.S. history (now on view at the Smithsonian) was hand sewn by Mrs. Mary Young Pickersgill and her two nieces. Truly a Star-Spangled (and battered) Banner. One of my favorite charity organizations, the Newman's Own Foundation, has organized a challenge called Honoring Those Who Serve to bring attention and support to a "select group of military service nonprofits ... that help those who serve." These groups are all doing meaningful work for our amazing vets, right in our own communities. Here are two organizations that caught Franny and Lou's eye. The first is called HERO DOGS. 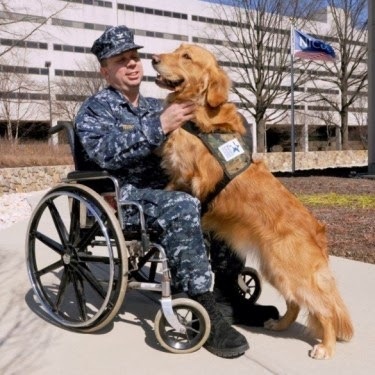 HERO DOGS works with veterans who have served in the U.S. Armed Forces and provides exceptionally trained service dogs to meet the special needs of the veterans due to injuries or other disabilities. As citizens of a grateful nation, we have an obligation to try to restore the former independence and ability of those veterans who have sacrified so much for the good of others and to protect our freedom. Here's a moving video about this organization and the work they do. We will be donating 50% of all profits from sales made in our shop today through Veterans Day to one or more of the Newman's Challenge participating organizations. It's the least we can do to give thanks and to honor and support these exceptional men and women and their families. What Veterans Day activities are going on near you? 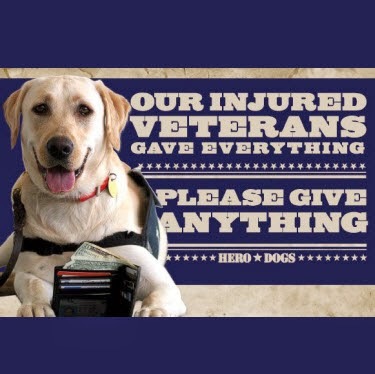 Check out the Veterans Affairs Office site. 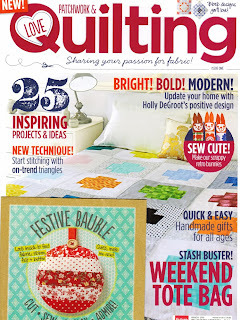 I had such a lovely time at the International Quilt Market in Houston! 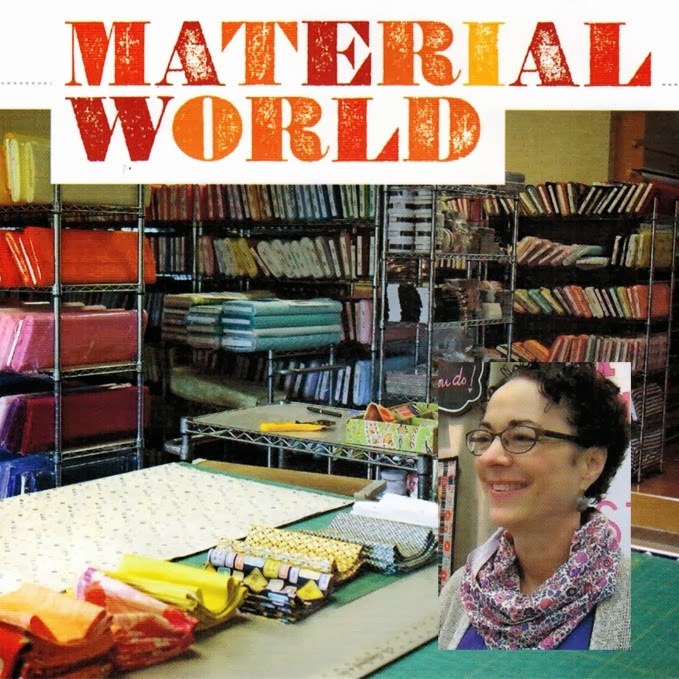 Thanks so much to Moda Fabrics for everything they do, every day. Going to market is such a special time because i have a chance to thank everyone in person for all their hard work throughout the year. It also affords me the chance to have some fun reuniting with Moda friends and fellows designers...and catching up with many passionate and creative quilters, quilt designers, and shop owners (market photos to come). I'd have to say that's my favorite part...connecting with YOU! I was so happy to see your projects using Sunnyside, In From the Cold, and even Daydream. Thanks to everyone who stopped by to say hello. It meant the world to me. ...and Lou pretended to be asleep whenever i sat next to him! That smile gave him away, though. 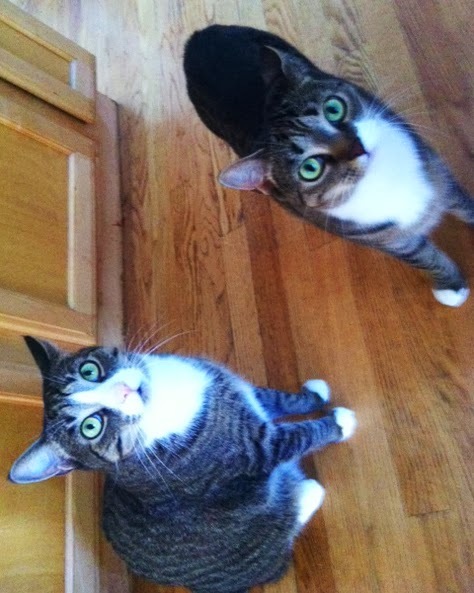 And it wasn't too long (and too many cat treats) before we were back to normal and ready to hand out treats on Halloween! Speaking of Halloween, we're running a little photo contest on Facebook. It's just for fun, and it's still open to entries if you'd like to join in. Just click here and upload a fun, creative photo (or more than one) of Halloween and/or Dia de los Muertos ... from wherever you are. Could be of parades, pumpkins, trick-or-treaters anything -- from this year or the past. Entries are accepted until midnight on Saturday, Nov 2 eastern time. The winner can pick his/her prize — either a jelly roll of In From the Cold fabric or $30 gift certificate and free shipping from our online shop! It's open to U.S. and International.